I found inspiration for this bento in one of Kidlet's coloring books. Bedtime bear looks so cozy on his cloud! 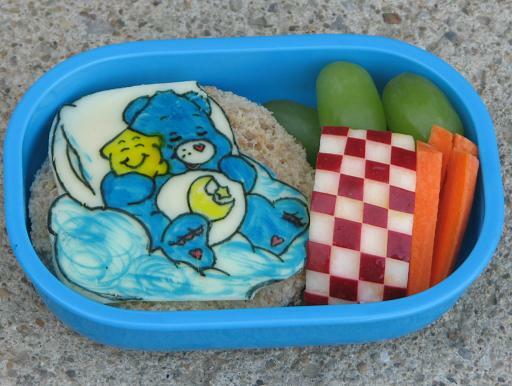 Bedtime Bear is food coloring on cheese on top of a peanut butter sandwich. On the side are grapes, carrots, and checkered apple. i just wanted to take a second to say that i love your blog! it's such an inspiration to see your amazing creations! i think it's so sweet that you keep track of these lunches, and it shows how much you love your kidlet. I love the Care Bears! :D Bedtime bear is so sweet!